Day 7 of CampNaNoWriMo and Day 2 of Teachers Write! I’m making progress. Definitely. It’s Day 7 of camp and my word count is now 11,039. At 11,039 words, I’m almost 25% of goal! I haven’t been able to write first thing in the morning most days; I am going to keep working on it. There’s lots of other stuff going on, but I’m not forgetting that it’s still my goal. I’d love to make that a part of my routine every day of the year. I’ve been writing all over the place. Post-Its, notebook pages, at the computer. That’s going well; when I have an idea, I jot it down. Then, I make sure it gets into the document. It does take a little time to catch up on typing what I’ve already written, but I’m happy that the ideas aren’t forgotten. I’m also doing a pretty good job at leaving the editing for later. I am very tempted to revise, but I know there will be time for that after the first full draft is complete. Surprisingly, this is the goal I’m having the easiest time with. I hadn’t been following the outline very well for the first few days. It was too constricting, and too many things were changing as I wrote. Luckily, I found another solution through a second camp I’m participating in this summer called Teacher’s Write! The task from Jo Knowles was “to find a blank page and make a list of what you know about your project, and the reasons this particular one is important to you.” That I can do! I’m hoping that this free-flowing list will continue to serve as my new outline. The other was definitely not working for me. Teachers Writ e! started yesterday. It’s an online writing program similar to CampNaNoWriMo, but targeted for educators who teach writing and want to become better writers themselves. I’ve always been a strong believer that teachers of writing should be writers themselves, so I was really excited to join this camp. What people are doing in London right now. Australia? Mexico? What cell phones will be like in two years. Five? Ten? About what it would be like if none of us had the sense of sight? The sense of smell? What if everyone lost the same sense at the same time? Or if we all developed a new sense at the same time? Because I’m already working on the other project for CampNaNoWriMo (and a good 11,039 words in), I did what I encourage my students to do all the time — connect a new assignment to other assignments. I observed people for a while and the observations I recorded and the ideas they sparked gave me new ideas for the existing characters in my novel. Some of my observations translated into new directions for the story. This is a really excellent exercise because good writers are great observers. After I worked on yesterday’s exercise for Teachers Write!, I came across an old notebook and flipped open to a random entry. You have no idea how many times I blinked and rubbed my eyes at what I saw! 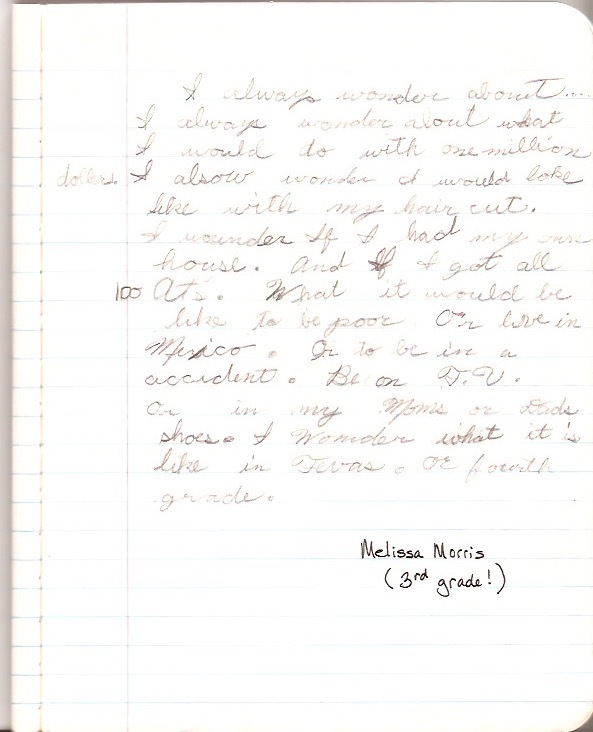 Sure enough, there was a very similar journal entry from when I was eight years old in third grade! Talk about kismet. My journal page from 3rd grade! I always wonder about what I would do with one million dollars. I also wonder what I would look like with my hair cut. I wonder if I had my own house. And if I got all A+’s. What it would be like to be poor. Or to be a in an accident. Or in my Mom’s and Dad’s shoes. I wonder what it is like in Texas. Posted in Education and School Related Things..., Melissa's Writing, NaNoWriMo	CampNaNoWriMofictionJo KnowleskismetPhil BildnerTeachers Write! I am so proud of you. Hope you can continue writing. That the words flow may continue flowing every day.